'Just try to learn the truth by approaching a spiritual master. Inquire from him submissively and render service unto him. The self-realized soul can impart knowledge unto you because he has seen the truth.' Unless one is tattva-darśī, in complete knowledge of the Absolute Truth, one cannot describe the activities of the Personality of Godhead. Therefore although there are many so-called Rāmāyaṇas, or histories of Lord Rāmacandra’s activities, some of them are not actually authoritative. Sometimes Lord Rāmacandra’s activities are described in terms of one’s own imaginations, speculations or material sentiments. But the characteristics of Lord Rāmacandra should not be handled as something imaginary. 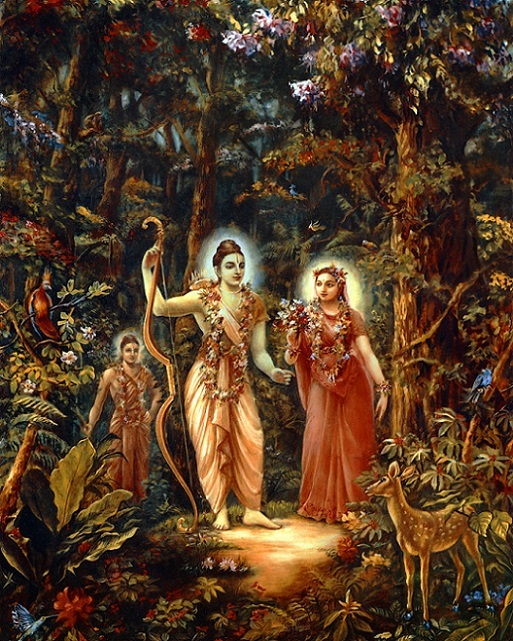 While describing the history of Lord Rāmacandra, Śukadeva Gosvāmī told Mahārāja Parīkṣit, 'You have already heard about the activities of Lord Rāmacandra.' Apparently, therefore, five thousand years ago there were many Rāmāyaṇas, or histories of Lord Rāmacandra’s activities, and there are many still. But we must select only those books written by tattva-darśīs (jñāninas tattva-darśinaḥ), not the books of so-called scholars who claim knowledge only on the basis of a doctorate." "The separation of Lord Rāmacandra from Sītā is spiritually understood as vipralambha, which is an activity of the hlādinī potency of the Supreme Personality of Godhead belonging to the śṛṅgāra-rasa, the mellow of conjugal love in the spiritual world. In the spiritual world the Supreme Personality of Godhead has all the dealings of love, displaying the symptoms called sāttvika, sañcārī, vilāpa, mūrcchā and unmāda. Thus when Lord Rāmacandra was separated from Sītā, all these spiritual symptoms were manifested. The Lord is neither impersonal nor impotent. Rather, He is sac-cid-ānanda-vigraha (Bs. 5.1), the eternal form of knowledge and bliss. Thus He has all the symptoms of spiritual bliss. Feeling separation from one’s beloved is also an item of spiritual bliss. As explained by Śrīla Svarūpa Dāmodara Gosvāmī, rādhā-kṛṣṇa-praṇaya-vikṛtir hlādinī-śaktiḥ: the dealings of love between Rādhā and Kṛṣṇa are displayed as the pleasure potency of the Lord. The Lord is the original source of all pleasure, the reservoir of all pleasure. Lord Rāmacandra, therefore, manifested the truth both spiritually and materially." "One feature of the Supreme Personality of Godhead Lord Rāmacandra is omnipotence. The Lord can act without regard to material impediments or inconveniences, but to prove that He is the Supreme Personality of Godhead and was not merely advertised as Godhead or elected by popular vote, He constructed a wonderful bridge over the ocean. Nowadays it has become fashionable to create some artificial God who performs no uncommon activities; a little magic will bewilder a foolish person into selecting an artificial God because he does not understand how powerful God is. Lord Rāmacandra, however, constructed a bridge over the water with stone by making the stone float. This is proof of God’s uncommonly wonderful power. Why should someone be accepted as God without displaying extraordinary potency by doing something never to be done by any common man? We accept Lord Rāmacandra as the Supreme Personality of Godhead because He constructed this bridge, and we accept Lord Kṛṣṇa as the Supreme Personality of Godhead because He lifted Govardhana Hill when He was only seven years old. We should not accept any rascal as God or an incarnation of God, for God displays special features in His various activities." "By the supreme will of the Lord, many great planets float weightlessly in space like swabs of cotton. If this is possible, why should great mountain peaks not be able to float on water? This is the omnipotence of the Supreme Personality of Godhead. He can do anything and everything He likes, because He is not under the control of the material nature; indeed, material nature is controlled by Him." "Somehow or other, Rāvaṇa was raised to an exalted position as the king of a great kingdom with all material opulences, but because of his sinful act of kidnapping mother Sītā, all the results of his pious activities were destroyed. If one offends an exalted personality, especially the Supreme Personality of Godhead, one certainly becomes most abominable; bereft of the results of pious activities, one must fall down like Rāvaṇa and other demons." "People are very fond of the pattern of Rāma-rājya, and even today politicians sometimes form a party called Rāma-rājya, but unfortunately they have no obedience to Lord Rāma. It is sometimes said that people want the kingdom of God without God. Such an aspiration, however, is never to be fulfilled. Good government can exist when the relationship between the citizens and the government is like that exemplified by Lord Rāmacandra and His citizens. Lord Rāmacandra ruled His kingdom exactly as a father takes care of his children, and the citizens, being obliged to the good government of Lord Rāmacandra, accepted the Lord as their father." "Lord Rāmacandra became King during Tretā-yuga, but because of His good government, the age was like Satya-yuga. Everyone was religious and completely happy."